CAN A SINGLE MEMBER BENCH IN STATE COMMISSION UNDER THE PROVISIONS OF CONSUMER PROTECTION ACT? When the factual and legal position in the Consumer Disputes Redressal Forums in District level are considered, it is an interesting question whether a Single member bench in a State Commission can pass judgments on merit? But when the amendment in Section 16 of the Act is read as a whole and the judgment to the point by Js Antony Dominic reported in 2013 (2) KLT 1, it is now the settled position in law that, the President of the State Commission can constitute a single member bench also. Though the innerline reading and the composition of the District Forums are discussed together, the answer would be confusing. However, now the position is settled. But the issue is if the said bench of the State Commission is a of a member not having legal background (not judicial background), what would be situation? The Regulation No. 12 of the Consumer Protection Act says, when an issue of serious question of law is involved and there is no precedent on the point, then the single bench with a non judicial member have to think twice. To be state otherwise, such questions has to be heard by a bench inclusive of President or any other bench with members having legal background. THE QUESTION IS, IF THE PARTY DOES NOT RAISE THE MOVE TO TRANSFER THE CASE, WHAT WOULD BE THE EFFECT? i) These Regulations may be called the Foreign Exchange Management (Acquisition and transfer of immovable property in India) Regulations, 2000.
ii) They shall come into force on 1st day of June 2000.
e) the words and expressions used but not defined in these Regulations shall have the same meanings respectively assigned to them in the Act. b) transfer any immovable property in India to a person resident in India. c) transfer any immovable property other than agricultural or plantation property or farm house to a person resident outside India who is a citizen of India or to a person of Indian origin resident outside India. (f) transfer residential or commercial property in India by way of gift to a person resident in India or to a person resident outside India who is a citizen of India or to a person of Indian Origin resident outside India. b) transfer by way of mortgage to an authorised dealer as a security for any borrowing, the immovable property acquired in pursuance of clause (a). (iv) in the case of residential property, the repatriation of sale proceeds is restricted to not more than two such properties. SHETTY COMMISSION PAY REVISION - GOVERNMENT ORDER- KERALA. recommendations have already been implemented in the State. among girls and to provide encouragement to meritorious students. born together are Single Girl Child of their parents. more marks / grades in the CBSE Class X Examination in that year. tuition fee charged in the year 2011 – 2012.
stated above in para 3(i). concession(s) given by the school in which she is studying other organization(s). cancelled shall not be renewed under any circumstances. Payment will be made through demand drafts/ pay orders. b) Pursuing Class XI & XIIfrom CBSE affiliated Schools. Executive Magistrate, as per prescribed format available on the Board’s website. (Photocopy of Affidavit will not be accepted). student is pursuing Class XI after passing Class X from Board’s Examination. enhancement for Class XI & XII. b) The decision of the Board shall be final and binding in all such matters. the sole jurisdiction of the court situated in Delhi/ New Delhi only. 1) That ____________is my only one daughter and her date of birth is _________. 2) That I am the father/mother and Ms. ________________ is my only daughter. 3) That I have no other child except my above named daughter. 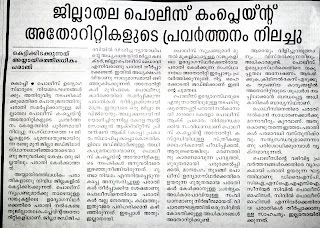 For last several months, there is no machinery in Ernakulam district to deal with the complaints against police officers. The Police complaint authorities was established in all Districts in order to dealt with the issues. 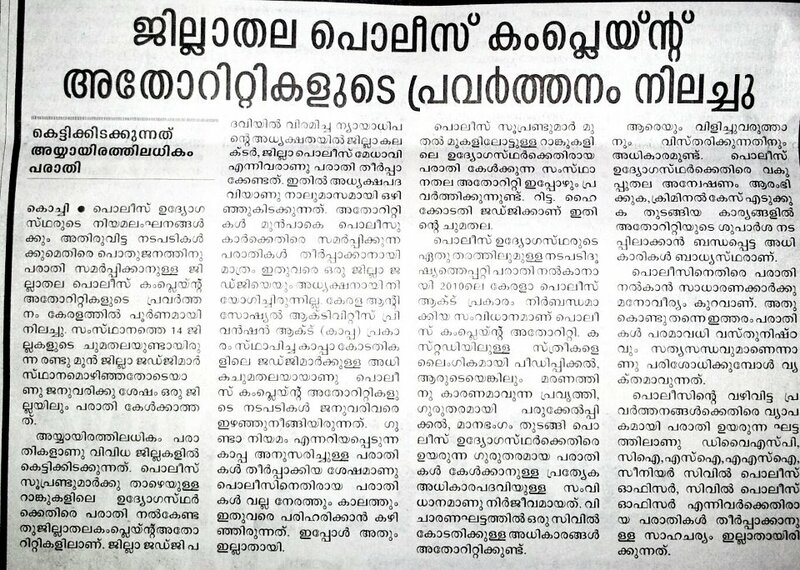 But due to one or other reasons, no sitting is there in the office of authority at Kakkanad. A speedy action need to be effected on this issue. decisions or orders of the Authority and for matters connected therewith or incidental thereto.